The secular and the sanctified met at the First Christian Church in Warrensburg, Mo. last weekend as three musicians took an audience on an auditory journey, talking about songwriting. The three differed in musical styles, but some commonalities were present, most notably, in talking about the external and internal qualities present in songwriting. The event “Songwriting the Art and Process” was a part of the University of Central Missouri’s Lifelong Learning series. The presenters were Mick Luehrman, Arthur Kemp, and Kasey Dawn Rausch, for an event that lasted around two hours and was divided into two segments, the first in which each musician talked about the songwriting process, with the second half being time for performances. All three presenters talked about finding inspiration via various forms. Luehrman was first to tell his story. He’s the chair of UCM’s department of Art and Design, and he’s been a performing musician since the 1970s. 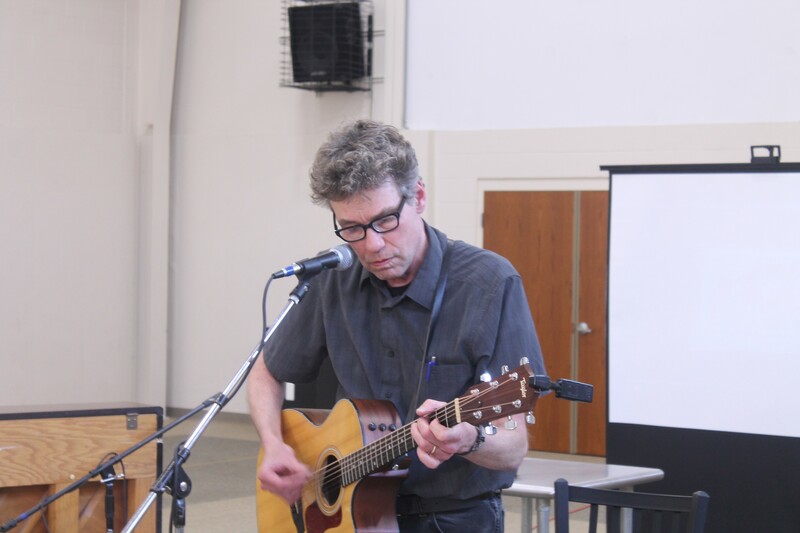 A lot of his talk centered on the mechanics of song writing – one of the first things Luehrman put emphasis on was how a musician should pay attention to music. “Studying good songs is one of the best ways to learn to teach yourself,” he said. “If you learn a lot of different songs, what I’ve found is that little bits and pieces come together there and form something new,” Luehrman said. Luehrman also stressed that a musician should try to be aware if he or she is unknowingly stealing from another song. “If you have borrowed maybe a little too much, that will become apparent to you,” Luehrman stated. Along with constantly listening to music, Luehrman suggested that the musician, the songwriter should constantly play one’s instrument daily. Luehrman also suggested drawing musical inspiration from everyday life. Luehrman suggested documenting song ideas and lyrics as soon as they come to mind, in order not to lose them. He said he wasn’t exactly sure where some of his song ideas come from. “You can think of it in a kind of spiritual type of way,” Luehrman said. 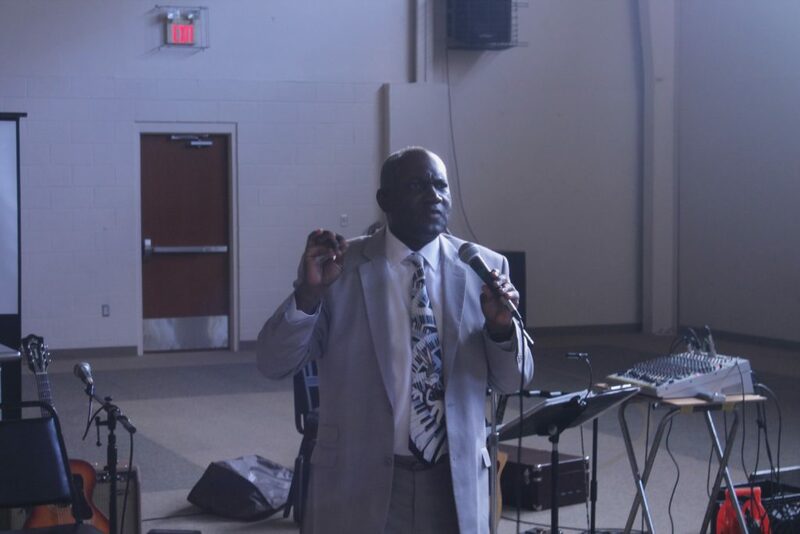 Arthur Kemp sings to the crowd at First Christian Church in Warrensburg, Mo. The next speaker was Arthur Kemp, professor of Psychology at UCM, and he declared the source of his inspiration to be directly spiritual. “I started playing the piano at age five and started playing the Hammond organ at age 12,” Kemp said. Kemp spoke of a structured, yet flexible, songwriting method of his called P.R.O.S. – an acronym, standing for perceptual, rhythm, occasion and situation. He then explained each facet of P.R.O.S. The rhythm method prompted lively audience participation, which Kemp proceeded to energetically respond to. His request was met with a few seconds of silence from the audience, which was broken with one hand smacking down onto a table, as others soon followed. When he rose from the piano bench, he continued telling the audience about his songwriting, coming upon the occasion method. In a gleeful state, he told the audience how much he loved the occasion method. At this point, Kemp’s cadence and presence resembled that of a minister, as he related a testimony about writing a song for his wedding in 1984. Weeks went by, and Kemp had yet to write his wedding song. “At 11:00 a week before my wedding, I heard these words, today we begin our life as one, it’s a union, with perfect harmony. I’ve waited so long for this day to come, and now my wish has come true,” Kemp said. The final musician to present was Rausch. She is a Kansas City, Mo. based songwriter who works in the Americana and Folk genres. She’s also the host of a radio show on KKFI 90.1 called “River Trade Radio.” Her presentation was titled “Within you, Without you” and she spoke about the use of introspection and observation of the world as songwriting tools. She recalled a story in which she was having a theological conversation with her grandfather when Rausch was in her late teens.